Sunnyside is a gem amongst the Bayside community. This lovingly maintained cottage enjoys the classic exterior, with a recently renovated interior, the perfect mix of old and new styles with nice amenities throughout. All of the Bayside charm has remained intact. Enjoy days on the beach or on the large wraparound porch taking in the splendor of Midcoast Maine. 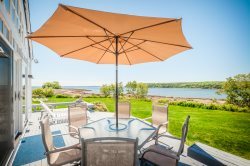 The top floor deck provides expansive views of Penobscot Bay. The large windows and sliding doors provide natural light throughout. With two updated full bathrooms and well-equipped kitchen, you will feel right at home. The cottage sleeps 6 in its King Room and Queen bedrooms with pullout couch in the main living room. Outside on the wraparound porch is comfortable furniture and a charcoal grill just steps from the deck. Walk a short distance to the public beach and landing, or picnic in Auditorium Park just seconds away. LEARN MORE ABOUT BAYSIDE: You can learn more about Bayside by visiting the Local Area Guide on Bayside on our website. BOATS INCLUDED? None, however if you are looking to rent kayaks, Water Walker or Ducktrap Kayaks offer those and can deliver them to the Property. LINENS & TOWELS: The rental of this property includes all bed linens and towels. Beds will be made up upon arrival and there will be one bath towel and wash cloth per listed occupancy, one hand bath towel per bedroom, one bath mat towel per bathroom, and two kitchen towels in the kitchen. Additional bath towels can be rented. SECURITY DEPOSIT: No, the owner of this property does not require a security deposit, however, guests are still financially responsible for non-accidental damages at the property. Cleaning: The property will be professionally cleaned before and after the rental. Smoking Is Not Permitted anywhere on or inside of any of our rental properties nor are those who may partake in tobacco smoking allowed to occupy any of our properties. Occupancy may not exceed what is posted for each home. Maximum occupancy could include infants and children. Boat Rentals and other amenities offered through On the Water in Maine Inc. are not available at all the properties we offer for rent. Boat Rentals through Maine Watercraft Rentals Inc. are offered Sunday morning to Friday after 4pm and include free delivery to the property. Check with an agent to find out what boats are available to rent at this property, or, when you process the booking here online, only the boats available for the property will be listed as available to rent. Please see our Policies Page for further questions regarding how to book this property and additional charges and fees. Contact a reservation agent for more details or to ensure you are booking the right property for you.